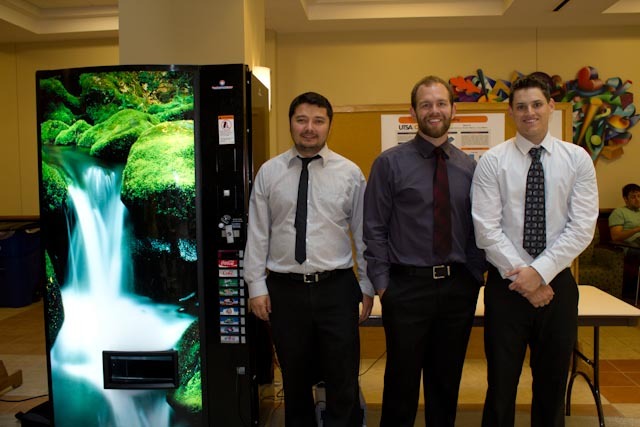 Dr. Elnakat at the Institute and the UTSA Senior Design Student Team: Richard Mackie, Cory Walton, & Jahongir Karimov were awarded a new vending machine to conduct research on this highly innovative and unusual project. Coca-Cola and The Institute issued an Energy Efficient Vending Design Challenge and this Senior Design student team took it on. The Coca-Cola Company’s products are distributed throughout vending machines in many public and private businesses. There are about 32 million Vending Machines worldwide and out of those, U.S. and Japan make up 50 percent of the Vending Machine industry. The total power used by all these devices in total is very high. A typical vending machine uses 3500 kWh per year. To put this in perspective, a modern residential refrigerator uses approximately 450-800 kWh per year. Total, there are roughly 7 million vending machines in the US (all types) and Coke (or their subsidiaries) own and operate 3.8 million vending machines worldwide. The ultimate goal of this project is to provide senior students an opportunity to apply what they learned and create a more energy efficient alternative. The main design idea is to reduce the space for cooling beverages and keep replacement fed into the smaller cooling area as each beverage is purchased. The machine will also be retrofitted with a sensor array that will ensure the machine is operating only when there is a need for cold beverages. Each member of the team is a senior in Electrical Engineering at the University of Texas at San Antonio and has nearly completed all required course work towards that degree. Throughout their tenure at UTSA each member has surpassed all challenges and excelled in their studies. The device being electro-mechanical in nature has led the team to incorporate Dr. Binzaid as the team’s technical mentor.